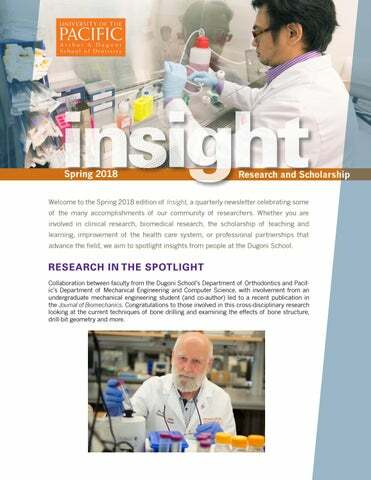 Welcome to the Spring 2018 edition of Insight, a quarterly newsletter celebrating some of the many accomplishments of our community of researchers. 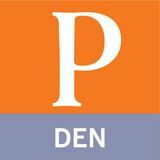 Whether you are involved in clinical research, biomedical research, the scholarship of teaching and learning, improvement of the health care system, or professional partnerships that advance the field, we aim to spotlight insights from people at the Dugoni School. RESEARCH IN THE SPOTLIGHT Collaboration between faculty from the Dugoni Schoolâ&#x20AC;&#x2122;s Department of Orthodontics and Pacificâ&#x20AC;&#x2122;s Department of Mechanical Engineering and Computer Science, with involvement from an undergraduate mechanical engineering student (and co-author) led to a recent publication in the Journal of Biomechanics. Congratulations to those involved in this cross-disciplinary research looking at the current techniques of bone drilling and examining the effects of bone structure, drill-bit geometry and more. Fig. 6. Rake and clearance angles of a twist drill bit: (a) geometry of rake and clearance angles; (b) positive rake angle; (c) negative rake angle; (d) zero rake angle. What is it? Research looking at the current techniques of bone drilling and examining the parameters and effects of bone structure, drill-bit geometry, operating conditions and material evacuation (removal). What problem does it aim to solve? Surgical bone drilling is performed for a variety of reasons including installing prosthetics and correcting bone fractures. Making sure that drilling doesn’t cause further damage—be it from the force of the drill itself or from the heat generated during drilling—is critical. How does it work? The researchers looked at multiple factors involved in drilling and their effects on the bone being drilled: thrust force, torque, heat accumulation/dissipation, cutting direction, bone density, the thickness of the bone’s outer layer, drill rotation and feed rate, drill bit shape, angles and wear and techniques used. EXCELLENCE DAY We are pleased to invite the Dugoni School community to Excellence Day 2018, happening Wednesday, May 23, from noon to 6:00 pm. Join us for a celebration of accomplishments of the brilliant minds here at the Dugoni School of Dentistry. This event serves as a showcase for research, clinical, and service achievements of our dental students, faculty, residents and staff. Focusing on our students’ outstanding work in clinical comprehensive dentistry, the clinical program is sponsored by the Dugoni School’s chapter of Omicron Kappa Upsilon (OKU) National Dental Honor Society. More details regarding the schedule will be forthcoming. For the first time, abstracts will be submitted to the University of Pacific digital repository, where they will be archived indefinitely at https://scholarlycommons.pacific.edu/excellence-day/ To submit abstracts, go to: https://scholarlycommons.pacific.edu/cgi/ir_submit.cgi?context=excellence-day We look forward to seeing you in our clinics and at the award ceremonies on May 23! Contact Insight: Have a suggestion for the next issue of Insight? Contact Dr. David Ojcius, Assistant Dean for Research and Chair of the Department of Biomedical Sciences, for editorial suggestions or to learn more about how to get involved in research at the Dugoni School. Email: dojcius@pacific.edu.